It’s the deadliest attack to hit the Syrian capital in months. 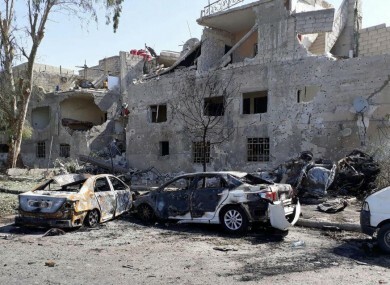 A SUICIDE CAR bomber pursued by security forces blew himself up in eastern Damascus today, with a monitor reporting that 18 people were killed in the deadliest attack to hit the Syrian capital in months. Syrian state media and the Syrian Observatory for Human Rights monitoring group said security forces intercepted three car bombers on their way into the city early this morning. State television said two of the vehicles were blown up on the outskirts of the city. A third man managed to reach the eastern Tahrir Square district, where he was surrounded but able to detonate a bomb. The Observatory, a Britain-based monitor, said 18 people were killed in the bombing, including at least seven members of pro-regime security forces and two civilians. It had not identified the remaining victims. Syrian state news agency Sana quoted an interior ministry statement as saying two of the vehicles had been “destroyed” at a roundabout on the road to the city’s airport. The driver of the third blew himself up while being pursued, it said, “killing a number of civilians, injuring others, and causing material damage to public and private properties”. An AFP correspondent at Tahrir Square saw extensive damage to nearby buildings. Two bombed-out cars were visible to one side of the square, which was strewn with debris. A woman was crying in an apartment near the site of the attack. Her balcony had collapsed and the living room was a mess of broken glass and shattered masonry, with pictures and curtains strewn across the floor. The woman said her daughter had been taken to hospital after being injured by flying glass. Tahrir Square resident Mohammad Tinawi told AFP he had heard “gunfire at around 6am (3am Irish time), then an explosion which smashed the glass of houses in the neighbourhood”. He said he had seen Red Crescent volunteers treating two wounded soldiers. A shopkeeper confirmed that the explosion had gone off at around 6am. Damascus has been spared the large-scale battles that have devastated other major Syrian cities during the country’s six-year civil war. However, dozens of people have been killed in bombings, particularly on the outskirts of the capital. In mid-March, bomb attacks on a courthouse and restaurant in central Damascus killed 32 people. That rare assault in the heart of the city, which remains under government control, was claimed by the Islamic State group. That came days after two explosions that left 74 dead in the capital’s Old City and were claimed by the Tahrir al-Sham coalition led by the jihadist Fateh al-Sham Front. Battlefronts around Damascus have calmed since a May deal that saw opposition fighters withdraw from several neighbourhoods, along with a separate agreement on “de-escalation” zones — including one in a rebel stronghold just outside the capital. Syria’s conflict broke out with anti-government protests in 2011, but has since evolved into a multi-front war that has killed more than 320,000 people. Email “Suicide bomber kills 18 after car chase in Damascus ”. Feedback on “Suicide bomber kills 18 after car chase in Damascus ”.